Second Life is a virtual world created by its inhabitants, it is as close to Stephensons view of the Metaverse in the seminal novel Snow Crash as you can currently get. 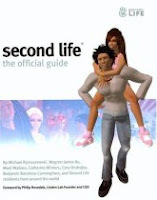 The Official Guide provides a step by step insight into the world of Second Life making it a recommend read before you actually download the software and experience the environment yourself. Such environments age quickly and in some ways with this book you are buying a snapshot of the history of Virtual Worlds. In a few years we will look back at such environments with amazement at their simplicity but for now we can enter the Metaverse, design our own Avatars and take part in the digital experience that is Second Life. If you don’t have a clue what Second Life or the Metaverse is – then we recommend you read Neal Stephensons Snow Crash and then Second Life the Official Guide. I don’t think it is available in the states, but Tim Guest’s Second Lives is also well worth a look. Seem that Tims book is out April 27th from what i can find.. looks interesting. I’ve put a link on the amazon site for preorder should anyone wish..
Yeah, I’m going on the strength of his ‘Guest Column’ in Edge magazine which focuses on peristant worlds and frequently on Second Life.